The Arts Council and the Vermont Department of Buildings and General Services maintain an exhibit at the Council offices at 136 State Street in Montpelier — next door to the Capital Region Visitors Center. 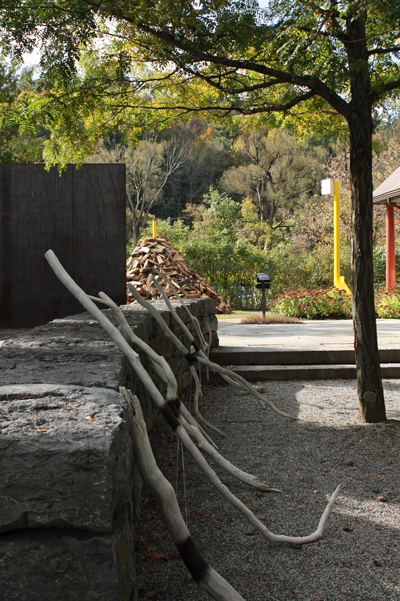 The Garden is a public/private collaboration featuring rotating two-year showings of contemporary work created by Vermont artists. Designed in 2002 by Burlington landscape architects H. Keith Wagner and Associates, it offers a place to picnic or engage in quiet reflection in Montpelier's downtown. This installation will evolve over two years, linked to the rhythm of slowly drying cordwood. Physical constructions, video and sound installations, artifacts, and event-based movement performances will come and go between fall 2017 and fall 2019. Scene One: Slumping opened the exhibit October 6, 2017. Scene Two: Falling, was presented February 2, 2018 and "Scene Three: Breathing" May 11, 2018. "Scene Four: Level Stacks" was installed September, 2018. The ​theme​ of this exhibit considers​ ​time​ ​specificity relevant​ ​to site​ ​specificity​ ​in​ ​the​ ​practice​ ​of contemporary​ ​sculpture,​ ​installation​ ​art​, ​and​ ​performance.​ ​The work​ ​installed​ ​for​ ​​"SiteTime"​ ​​invites​ ​the​ ​public​ ​to​ ​think​ ​about​ ​and​ ​create​ ​new​ ​perspectives​ ​of what​ ​is​ ​then,​ ​what​ ​is​ ​now​, ​and​ ​what​ ​is​ ​to​ ​come — ​all​ ​relative​ ​to​ ​Vermont​ ​and​ ​our​ ​global​ ​relativity. The​ ​artists​ ​have​ ​chosen​ ​to​ ​work​ ​directly​ ​with​ ​the​ ​cyclical activity​ ​of​ ​sourcing,​ ​processing,​ ​and​ ​consuming​ ​cordwood​ ​for​ ​heat​ ​during​ ​the​ ​cold​ ​months because​ ​of​ ​its​ ​vital​ ​way​ ​of​ ​connecting​ ​our​ ​hands​ ​and​ ​our​ ​energy​ ​to​ ​the​ Earth​ ​as​ ​it​ ​rotates around​ ​the​ ​sun.​ ​The​ ​cordwood​ ​process​ ​itself​ ​is​ ​active​ ​and​ ​constantly​ ​in​ ​flux.​ ​The​ ​artists​ ​are collectively​ ​taking​ ​direct​ ​cues​ ​from​ ​researching​ ​and​ ​experiencing​ ​the​ ​process​ ​for​ ​themselves​ ​in creation​ ​of​ ​the​ ​work — all​ ​in​ ​an​ ​effort​ ​to​ ​share​ ​a​ ​series​ ​of​ ​new​ ​perspectives​ ​of​ ​an​ ​age​-old practice.​ The​ ​actions​ ​and​ ​physical​ ​products​ ​will​ ​be​ ​encountered,​ ​discussed,​ ​and​ ​documented. Evolution​ ​of​ ​the​ ​exhibition​ ​answers​ ​the​ ​question​ ​of​ ​what​ ​makes​ ​space​ ​productive​ ​and challenging​ ​at​ ​the​ ​same​ ​time.​ ​The​ ​community​ ​will​ ​be​ ​invited​ ​to​ ​participate​ ​as​ ​elements​ ​of​ ​the exhibition​ ​are​ ​revealed.​ ​The​ ​clock​ ​will​ ​start​ ​ticking​ ​in​ ​October​ ​2017. 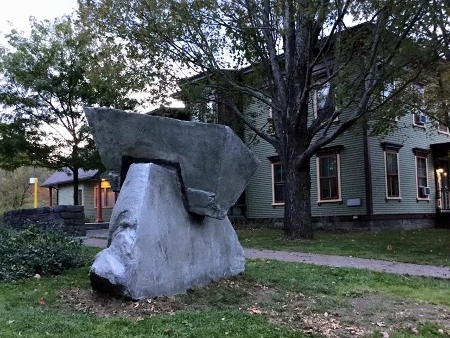 The​ ​entrance​ ​to​ ​the​ ​Sculpture​ ​Garden​ ​is​ ​anchored​ ​by​ ​Justin​ ​Kenney’s​ ​“Eating​ ​of​ ​Morals.” This​ ​monumental​ ​concrete​ ​sculpture​ ​was​ ​chosen​ ​through​ ​a​ ​competitive​ ​call​ ​to​ ​artists​ ​who participated​ ​in​ ​the​ ​Vermont​ ​Arts​ ​Council’s​ ​Breaking​ ​Into​ ​Business​ ​workshop.​ ​As​ ​with​ ​the​ ​wood,​ ​Kenney’s​ ​piece​ ​is​ ​transformative.​ ​Created​ ​from​ ​negative space,​ ​the​ ​wax​ ​molds​ ​holding​ ​the​ ​concrete​ ​reveal​ ​the​ ​two​ ​forms​ ​coming​ ​together. The public can enter from the city sidewalk on State Street, or from the parking area where there are two accessible parking spots at the garden's entrance. All sculpture is visible from a walkway that crosses through the garden; the surfaces are concrete, finely crushed gravel, and flat slate. There are two steps into the lower garden, and snowbanks may block access to some areas of the garden in the winter. In the summer, visitors may enjoy the picnic table on the grass just beyond the pathway.